Acer's Gemstone range targets the regular consumer, with the Aspire 6920G-594G32Bn (£699 inc. VAT) sitting in the middle of the range and offering lots of features at a reasonable price. It's a useful multimedia centre, aided by its bright, colourful widescreen display. With a 16:9 aspect ratio, it's perfectly suited to watching movies. The low 1366 x 768-pixel resolution is a slight disappointment on a machine of this size, as it means you won't be able to take full advantage of the integrated high-definition (HD) Blu-ray drive. Family use is enhanced by the powerful Nvidia GeForce 9500M GS graphics card, which provides enough performance to run the latest games, edit videos and carry out other tasks with ease. Considering the powerful GPU, the battery life of 192 minutes is reasonable and gives this machine a degree of portability. The Acer's keyboard is large with responsive keys, although the very long travel can slow down touch-typists. There's also a large degree of flex to the board, letting down the quality of this otherwise robust machine. To the right of the keyboard you'll find a set of hotkeys for turning on wireless functions, launching an email application and starting an internet browser. The left side of the chassis hosts Acer's CineDash – a large, touch-sensitive set of buttons for controlling media functions and volume settings. Although functional, it takes up a lot of space on the chassis. The plastics used are of a high standard, with a textured finish on the inside that's attractive and hardwearing. The blue finish to the lid is also stylish, although attracts fingerprints and grime easily. Along with a high-quality chassis, this machine also features cutting-edge components, with a 2.2GHz Intel Core 2 Duo processor and 4096MB of memory in place. Everyday performance proved impressive, with enough power to multitask with ease. 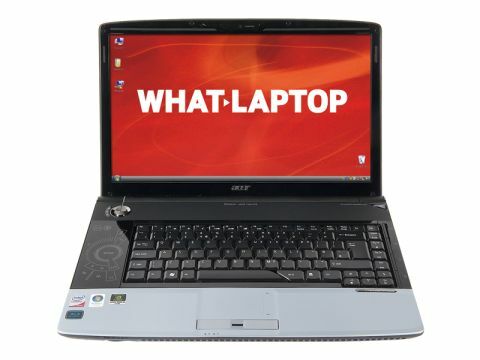 This is one of the most fully featured laptops at this price, offering a large 320GB hard drive, a Blu-ray optical drive, and great connectivity. You'll find the latest 802.11n Wi-Fi adapter and Gigabit Ethernet for fast fixed connections. Four USB ports make it easy to connect peripherals, and Bluetooth is built in for wireless devices. There's also a 6-in-1 memory card reader for transferring files between this and other devices. If you're looking for power on a budget, then few machines come close to matching the Aspire 6920G-594G32Bn. It packs a lot into its well-made chassis, with only the springy keyboard and low-resolution screen letting it down.